Infants, toddlers and young children are most at risk of drowning, but a child of any age can be at risk and it should not be assumed that accidents will not happen, just because a child is older, or has previous swimming experience. Water quality related health complaints. Steps can be taken to greatly reduce the chances of accidental drowning. Even those who don’t have children should consider the child safety aspects of owning a pool – consider for example whether a neighbour’s child could find its way, unsupervised into your pool? If you do have children, one of the most important steps you can take is to raise their awareness of water safety and to ensure that they are taught to swim as early as possible – classes are available at leisure centres nationwide. However, even if your child can swim, it’s important to remember never to leave any child unattended around your pool. Children can drown in minutes – and sadly, many children have drowned whilst a parent has ‘popped to the loo’ or ‘nipped indoors to answer the phone’. So if you need to leave the pool, always take young children with you. Even older siblings may not be capable of watching younger children in water. They may fail to judge danger correctly, or may be unable to act quickly enough in the event of an emergency. It is always safest to ensure that a competent, responsible adult is supervising your child. As well as good pool supervision, pool safety covers, fences and alarms save lives. In France, pools now have to be fitted with a safety cover or alarm. There is no requirement yet for pool owners to fit such devices in the UK, but this may well change. Investing in one or more of the following can offer real peace of mind and can help to make your pool a more ‘family friendly’ place. Safety Pool Covers – If you have young children or pets you should consider investing in a safety pool cover. Safety covers are different from the ordinary pool cover as they’re designed to hold a person’s weight – to ensure that a child cannot fall into your pool. They can be fitted on various shaped pools and pool owners can choose between automatic and manual options. Safety Fences – Swimming pool safety fences run around the outside of a pool, blocking access to the pool – child safety gates should be fitted to pool fences, to ensure that only adults and older children can access the pool unaided. A fence should be no less than 1.5 meters high to prevent children from climbing over and should be regularly checked and well maintained. 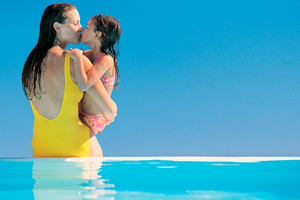 Safety Alarms – Pool safety alarms are designed to alert you if your child or pet falls into your pool. Again, these should be checked regularly and well maintained, to ensure that they are working correctly. Carry a cordless phone or mobile – this may save valuable time in emergencies and will remove the need to go inside to answer the telephone. Seconds count in drowning incidents so if ever you’re unsure as to where your child is – check the pool first (even if access to your pool is restricted). Safety devices, such as life belts, safety rings and life jackets, should be stored near the pool for use in case of emergency. It is recommended that children under 3 do not enter the pool without a life jacket. When the pool is not in use, try not to allow children to use this area as a ‘play area’. Instead, teach your children about the dangers of the pool – just as you would teach them about road safety. Create a set of ‘pool rules’ and teach children to abide by, and respect them. Never leave tables and chairs against pool fences. Don’t assume that a child is safe, just because it’s wearing flotation aids. Swimming aids such as arm bands and swim vests are NOT life saving devices. Do not leave objects in your swimming pool that may attract your child’s attention. A toy in the water, for example, may encourage an unsupervised child to try to enter your pool. To prevent falls and slipping around the pool, consider laying anti-slip flooring or matting, this can really help to reduce injuries. The area around the pool should be swept and cleaned regularly. Stones and other objects, such as broken glass may cause injury if they find their way into your pool. Supervise older children – don’t assume they’re safe just because they can swim. Remember that anyone can run into trouble whilst swimming. Monitor your pool water quality and carry out tests regularly. You should check pH levels and chlorine, as well as other chemicals, to ensure that water is safe and that it doesn’t cause skin irritations. Keep pool chemicals stored up high and out of children’s reach. Your local pool company will be able to advise you on fitting safety and security devices to your pool. To find their details you can use our directory above or click here. What measures have you taken to protect your family? Let us know in the comments box below.